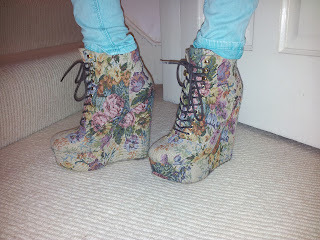 I know I say it about almost every pair of shoes I own but these bad boys are my favourites. They are SO comfy, SO high and just wild. I love how they are a pretty floral tapestry but are so clumpy and chunky. I bought these about a year ago but ASOS have now brought out lots of different colours and prints... yes, that is dancing gingerbread men on the mint green pair. They are £60, and if you hurry you will manage to grab the snake print pair on sale for £36.